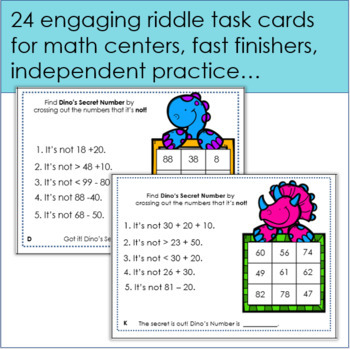 Here’s a set of 24 task cards that will strengthen your first graders’ skills in adding and subtracting ten and multiples of ten. 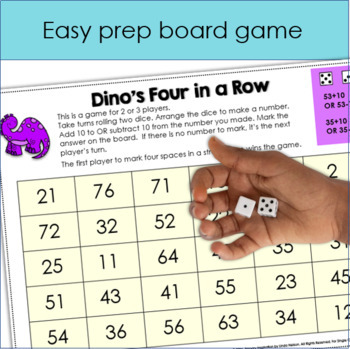 Choosing from nine numbers, your students will determine Dino’s Secret Number by eliminating eight of the options. With each card they do, your students will complete nine examples of adding and/or subtracting tens ... that's 216 in all! A student recording page, answer key, and 120 chart for extra support are also included. 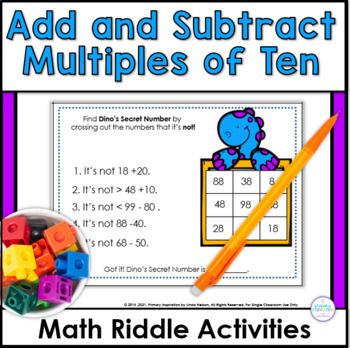 Math skills addressed in this set include adding and subtracting ten and multiples of ten within 100, and comparing numbers within 100 using greater than and less than symbols. * Use in a small group for extra practice or remediation. Great for RTI! Adding and Subtracting Multiples of Ten ~ Pirates! Would you like to save money on future TPT purchases? It’s easy! Please go to your My Purchases page. Beside each purchase you'll see a Provide Feedback button. Just click it and you will be taken to a page where you can give a quick rating and leave a short comment about the product. Your feedback is important to me! It helps me to improve products and design the new resources you need for your classroom.